In April of 2013, just prior to Duncan's 4th birthday, he enrolled in the Tiny Tigers program out of the Rinks at Shelton. While nearly an hour's drive from our home, Duncan was very excited to be a "real" hockey player and, I'll admit, I was pretty excited too. We selected the program as it was the only one I could find that openly accepted children under 4-years of age during the Spring. The program was advertised as an entry level point for children looking to learn to skate and play hockey. Seeing as Duncan was just getting the hang of skating without any help, it seemed appropriate. 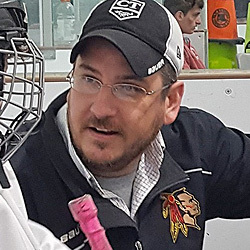 Five minutes in... it was clear that this program was filled predominantly with older children already enrolled in hockey programs just looking for a skills session during the off-season. Never-the-less, Duncan seemed unfazed by it all and particpated each week enthusiastically. The coaching staff was made up of three or four adults and a couple of them stood above the others. Like...way above. One coach was clearly unaware that this was dubbed as an "introduction" to skating, visibly frustrated with the kids that were less than steady on their feet or unable to get back up on their own.